Every time a local election bus rolls through Cape Town’s rambling townships and informal settlements, you can bet your bottom dollar one of the key lobbying issues for votes will be the promise of new houses for some of South Africa’s poorest citizens. 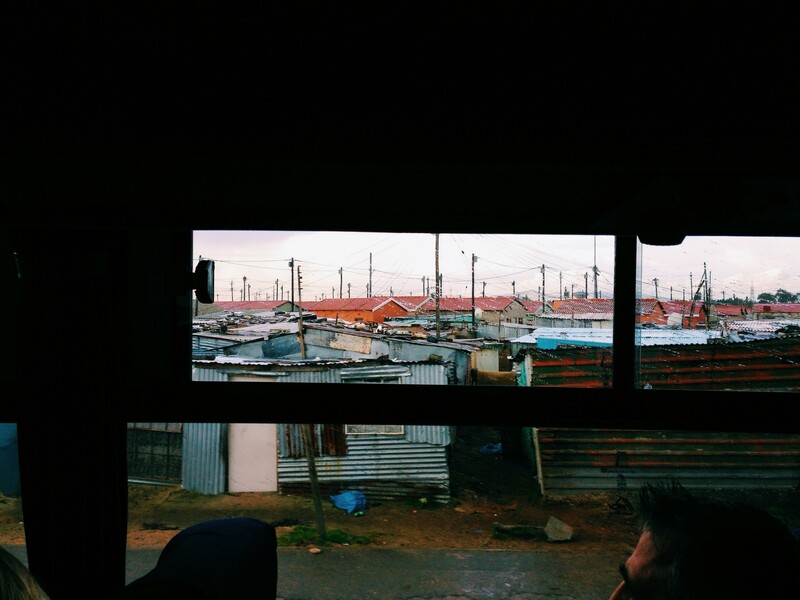 But looking around townships like Khayelitsha, Philippi and Kayamandi that promise so far has been incredibly hollow. Twenty-one years into democracy and still so many people are waiting for basic housing and services like electricity and running water. Sprawling Khayelitsha is home to more – some have estimated – than a million people, and as is the case in countless informal townships around South Africa most residents live in ramshackle tin shacks cobbled together from whatever scraps they can find, with water coming from public taps scattered throughout and public portable toilets, known locally as porta portas, as the only available washing facilities. Worse still, every year these settlements are hit hard by flash floods and fires that raze shacks to the ground, leaving hundreds destitute. Many have been on the housing list for years, but because of slow processes and bureaucratic red tape they are still waiting. It’s a serious hotbed issue: many residents here work hard but still live well below the poverty line and qualify for government-sponsored housing. Others are elderly citizens and are owed basic housing as compensation for imbalances during the time of apartheid – many have been on that housing list for more than twenty years, but because of the incrementally slow processes and bureaucratic red tape they are still waiting, and waiting. For some residents though, waiting in perpetuity is not acceptable. 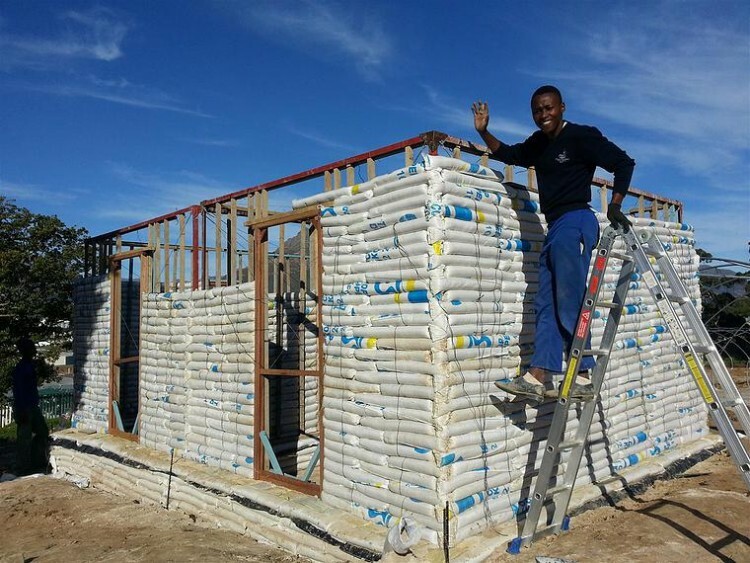 In Kayamandi on the outskirts of Cape Town, 22-year-old Abongile Mamoosa and his friends are taking the bull by the horns and building houses made of sand. At first Mamoosa’s story sounds familiar – forced to find a job right after high school to help support his eight family members Mamoosa was unable to fulfil his dream of going to college. But with a little bit of hustle, and a chance meeting with a local philanthropist and developer, he secured a spot at social entrepreneur incubator Hubspace, and learnt how innovatively answer the housing problem. The concept of sandbag homes in themselves are nothing new; across the world designers have been using sandbags for years to design innovative low-cost homes. In South Africa, for example, the Design Indaba has been running a competition for years for young designers, innovators, and graduate students, called the 10×10 Low Cost Housing Project, aimed at simulating alternative solutions to the country’s housing problems. Each house costs around US$1,000 to build and can be constructed in just under two weeks. Mamoosa’s offering differs in the shape and structure of both the sandbags and the actual micro-homes. The bag itself is a cylindrical double-bag filled with sand from local factories. The team start with a 12-metre foundation building up to 15 centimetres off the floor – that’s the foundation which is quickly reinforced with a sturdy steel mesh that forms the structure of the home. 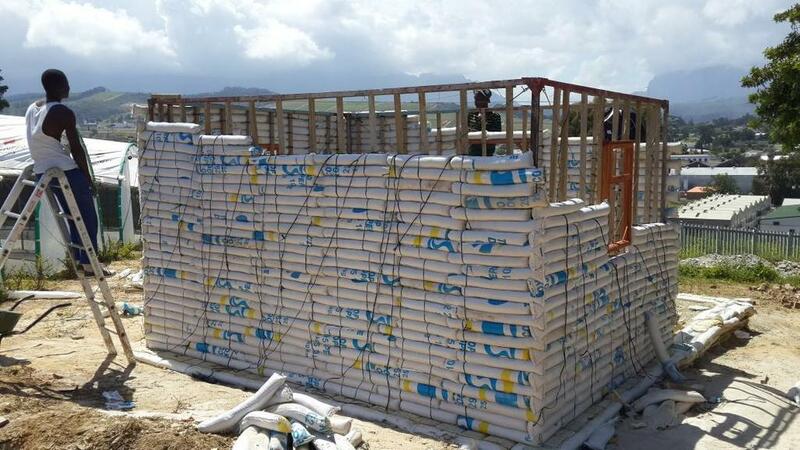 Then single bags are stacked all the way to the top of the mesh structure, more sandbags are stacked around the house, the walls are quickly strengthened, and a roof is constructed from wooden planks. The walls are also insulated with a simple mixture of soap and concrete with plastic and polystyrene balls. Simple, right? They’re cheap too – each house costs around US$1,000 to build and can be constructed in just under two weeks. 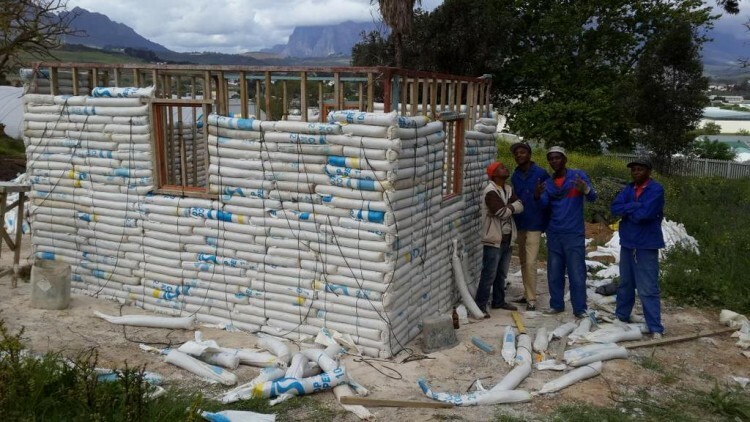 The pilot part of this project kicked off in March this year with five houses already built, two in Philippi and three in Kayamandi, which is a considerable achievement considering the grassroots nature of this endeavour. What’s important about these homes is that they’re sturdy and fire- and flood proof. They also facilitate easy and incredibly marketable skills to learn, just as Mamoosa and his friends did, and can create hundreds of jobs and be managed by the communities themselves quite easily… essentially killing two birds with one, um, sandbag. If Mamoosa is the heart of this innovative program then local entrepreneur Peter Shrimpton is its brain. Entrepreneur Shrimpton – owner of social investment firm Heart Capital that secured funding for both the sandbag homes project and a collaborative community food-garden project, Foodpods, aimed at alleviating hunger in the township – started Hubspace Khayelitsha back in 2013 to help young locals develop skills that would help them become innovators and entrepreneurs themselves. Hubspace isn’t meant to be a non-profit, or a charity, it’s a business through and through. The young future entrepreneurs here are encouraged to think like businessmen and –women, building enterprises that make money and contribute to building the local economy without expecting handouts. Aside from Mamoosa, the centre has already turned out a few success stories that’ve started their own profitable businesses including a seedling nursery owner, a bee-keeper, and a landscape architect. Clever design and fresh talent will not solve all the township’s housing problems… in a lot of cases, red tape won’t let entrepreneurs convert tin shack into actual homes. 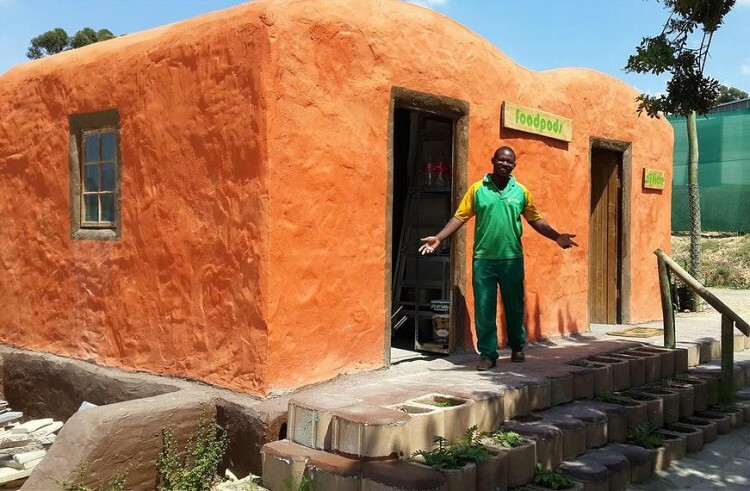 Programmes like Hubspace are kindling a fire of sorts in these townships, igniting a spirit of positive change and free enterprise that can help residents come up with answers to some of the country’s most critical developmental problems themselves, without waiting for government to fulfil old election promises. This attitude it not simply optimism or wishful thinking, it’s critical if the country is to grow its stuttering economy. Although clever design and fresh talent will not solve all the township’s housing problems… surprisingly, in a lot of cases, bureaucratic red tape won’t let entrepreneurs convert tin shack into actual homes. The reason is that the land where these settlements exist is often owned by the municipality and while a shack erected there is considered ‘illegal squatting’, though the council doesn’t evict you, erecting an actual home in the same place would require a building permit, which you cannot get if you can’t produce a deed ownership for the land. It’s a tricky catch-22 legislation that was well-intentioned and meant to stop illegal land grabs (and fulfils that function in many cases) but is now also inadvertently hampering progress in some areas. It’s possible though that Shrimpton and Mamoosa’s sandbag homes could slip between all the jargon: if these homes are made from sandbags and not bricks – though the end result might be just as solid and sturdy – does it really require the same permits? It’s exactly this kind of question that this project and others like it are trying to answer.